Sightseeing vehicles on the corner of School Street and Washington Street. 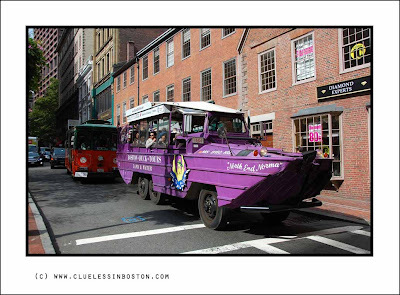 these are the amphibious vehicles right? mumbai is planning to have them soon! London has had a couple of these for some years now, they are in a sort of bright yellow/orange and they are very popular. I think they do go on the river as well on these tours. Boy is that purple! How strange! Do they cross the river or the bay with that? A good way to use old military vehicles! We have a company with the same name. I wonder if they are related? That's a fabulous color! I also like the name on the front "North End Norma". Do they take tourists into the bay, also? Looks like something you'd see at Disney!